"We welcome you to The Durrance, a large and spacious Victorian Farmhouse set in a peaceful location with views of open countryside and surrounding farmland. Even though we are within easy reach of Bromsgrove, Droitwich and Kidderminster you can experience a get away from it all feeling in the heart of the Worcestershire countryside." We welcome you to The Durrance, a large and spacious Victorian Farmhouse set in a peaceful location with views of open countryside and surrounding farmland. Even though we are within easy reach of Bromsgrove, Droitwich and Kidderminster you can experience a get away from it all feeling in the heart of the Worcestershire countryside. As you drive into the courtyard the farmhouse bed and breakfast is situated on your right and to your left are our recently converted ground-floor cottages, Oxen and Cider Mill. There is ample off road parking next to cottages and farmhouse bed and breakfast and a hard tennis court for you to enjoy. Tom our eldest son has his own free range hens so children can help collect the eggs for their breakfast. We have three large and comfortably furnished en-suite bedrooms. Two rooms are twin bedded and one double room, all of which are ideal for accommodating family groups. Cots and folding beds are available. We have a downstairs room suitable for people who find stairs a problem. Each room has a colour television and tea/coffee facilities. Our guests' accommodation is separate to the family living area - giving you total privacy. During the summer months you can enjoy afternoon tea in the garden and for the more energetic a game of tennis - plenty of racquets and tennis balls to hand! Throughout the winter a welcoming log burning fire awaits you in the guests lounge. Oxen and Cider Mill are two recently converted ground floor cottages. Each cottage has a fully fitted pine kitchen, including dishwasher, microwave and fridge freezer. The lounges are spacious with high ceilings exposing original oak beams and French doors leading to a sheltered patio area and each has its own garden. A barbecue is available during the summer months. The bathrooms have a bath with a shower and there is full central heating. The bedrooms are spacious with antique pine furniture. All beds are made ready for your arrival with sheets and duvets provided; extra blankets are available. All towels and tea towels are provided and electricity is included. Oxen Cottage has one double bedroom and a twin bedroom. Cider Mill Cottage has a double bedroom and a single bedroom. A laundry room with a washing machine tumble dryer and ironing facilities is available, situated between the cottages. Cottages will be available from 4 pm on the day of arrival and should be vacated by 10:30 am on the day of departure. 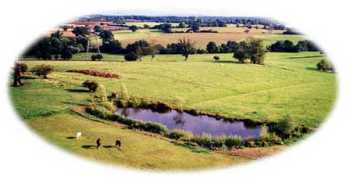 We are situated on the quiet road overlooking beautiful open countryside. There are many marked footpaths across nearby farmland for walking and sightseeing, and there are local maps for you to borrow. Severn Valley Railway is one of the premier preserved steam railways in Britain, running from Kidderminster to Bridgnorth. Travelling along the route of the river Severn and through the Wyre Forest, you can break your journey at any of the stations en route. Situated just outside Bewdley, you can drive through the animal enclosures, and then visit the amusements in the park. Historical Cathedral city, Royal Worcester porcelain. Cadburys World, Sea Life Centre, Symphony Hall, Indoor Arena, Museums, Shops and Markets are only 30 minutes away. Stratford, Warwick, Malvern, Ironbridge and the Welsh Borders are all within easy reach. Enjoy a game of tennis after breakfast or during your stay in one of our cottages. Plenty of racquets and balls available. Take exit 4. Follow A38 into Bromsgrove and then A448 towards Kidderminster. We are 3½ miles from Bromsgrove. Turn left into Berry Lane (sign on A448 to The Durrance) we are ½ mile on left. Exit 1 (west bound only) and follow A38 to Bromsgrove and then the rest as above. Take exit 5. Take A38 towards Bromsgrove. After 1½ miles, pass Webbs Garden Centre, take next left by The Swan Inn into Swan Lane. Follow lane for 2 miles along on right hand side (at the top of hill). A limited bus service is available on the A448 - Bromsgrove to Kidderminster. Why not visit the Durrance home page?